The Torah (Vayikra 19) states: “And you shall not destroy the edge of your beard.” The Gemara in Masechet Makkot (20a) explains that one is not liable unless he has shaved his beard with a razor blade which is considered a shaving which causes “destruction.” However, shaving with scissors is not forbidden according to the letter of the law even though it might appear like shaving with a razor. Nevertheless, the Ritba (ibid. 21a) writes, “’And they shall not shave the edge of their beards,’ according to the letter of the law, if one shaves with scissors, even in a way that is similar to a razor, this is permissible. However, it is customary among pious individuals not to do so due to suspicion by onlookers. This is indeed the proper way to behave.” Indeed, most of the great Rishonim are of the opinion that, halachically speaking, one may shave his beard with scissors although he is shaving close to the skin of his face. Maran HaShulchan Aruch (Yoreh De’ah, Chapter 181) rules likewise that it is permissible to shave with scissors (even though it is) similar to a (shave achieved by using a) razor. Nevertheless, shaving one’s beard with an actual blade constitutes a very grave Torah prohibition and one who does so may not serve as Chazzan and pray on behalf of the congregation, for he is deliberately transgressing one of the Torah’s severe laws. The punishment for this is delineated by the holy Zohar and the books of the Mekubalim and is considered a great and terrible sin, among the most grievous. In recent generations, a novelty has entered the shaving industry: the “electric shaver.” Although there have been great luminaries, including the great Rabbeinu Yisrael Meir HaKohen of Radin, author of the “Chafetz Chaim,” who have completely prohibited using such machines, nevertheless, many others have customarily acted leniently and used these machines. There is much discussion about this among the Acharonim. The primary reason to rule leniently on shaving with an electric shaver is based on what we have discussed that although one may not shave his beard with a blade, nevertheless, shaving with scissors, even if afterwards it may seem as though one has shaved with a blade, is permissible according to the letter of the law. Since the mechanism of most electric shavers is based on the movement of two parts, a blade and another piece of metal against it, and upon coming into contact with the hair, the revolving blade does not cut the hair alone without the other piece of metal being pushed against it thus causing the hair to be pressed between them and get cut, this would seem to be the actual “scissor-action” which we have written above is permissible even if it appears like one has shaved with a razor. This is especially true since the shaver does not come into direct contact with one’s face; rather, there is a screen which separates between the blades and one’s face so the individual who is shaving does not get cut. In this way, there is no concern about actual shaving and it is tantamount to any other kind of trimming of one’s beard with scissors which is in no way prohibited since one is not actually shaving his beard completely. Hagaon Rabbeinu Tzvi Pesach Frank zt”l has also ruled leniently that one may in fact use electric shavers while taking care not to press the machine tightly against one’s face in which case there is no concern that the blades will make contact with one’s face and in this way, one may be lenient. However, among some of the newer electric shavers produced in the past few years a new problem has emerged: since the manufacturers of these shavers want the shave to be completely smooth by having the blades to come into as close contact as possible with the face, they have begun manufacturing extremely thin, flexible screens which separate between the blades and the skin of the face. Since the skin of the face is somewhat flexible, pressing this kind of machine against one’s face causes the skin of one’s face to come into direct contact with the blades of the machine and this may cause a situation to arise where the blade will cut the hair immediately, exactly like the “razor-action” prohibited by the Torah. Therefore, some great Poskim advise that it is better not to use such shavers while others rule leniently even on this matter based on other reasons. 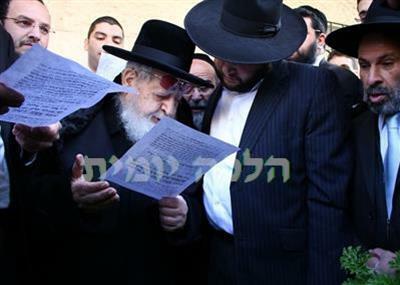 Halachically speaking, Maran Harav Ovadia Yosef Shlit”a writes that that if one acts leniently and shaves with an electric shaver when the need to do so is great, such as in order to earn one’s livelihood or because the lack of shaving will cause discord in the home, he has on whom to rely. However, this is only on the condition that one is careful not to press the shaver tightly against the skin of his face so that not even one hair on one’s face is cut directly by the blades, as we have explained. Nevertheless, since this matter borders on a Torah prohibition, it is preferable for whoever is has the ability to do so to only shave using a shaver which does not raise any of these concerns, for example, if one is confident that a certain machine does not shave off the entire hair and leaves over a small portion of it. Another option, which is the most preferable, is to let one’s beard hair grow even slightly in nice and groomed manner and in this way one will have fulfilled all opinions. However, one who shaves with an actual razor blade must distance himself from this grave prohibition and switch to using an electric shaver in the method which we have prescribed which nowadays provides one with quite a decent shave in a manner which is sufficient even for those who have shaved with an actual razor blade.